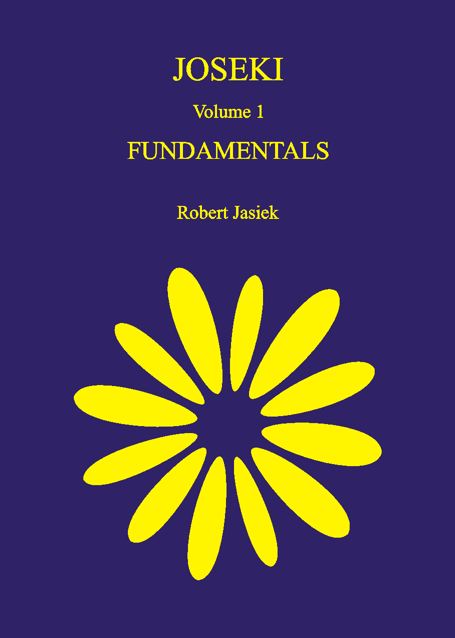 The author and publisher of Joseki / Volume 1: Fundamentals is Robert Jasiek. The book is of A5 size, has 268 pages, has 4 diagrams per page on average, is written for players from 18 kyu to 3 dan and has the suggested price EUR 26.5 (book) or EUR 13.25 (PDF). Deutsche Go-Zeitung 4/2009, p. 44. Robert Jasiek's writing style is off putting. He not only defines foreign language Go terms, but redefines common English terms in a non-intuitive way, which is difficult to read. RobertJasiek: Do you call an opinion on one aspect of a book (its definitions) a review while you do not describe all other aspects of the book? Fundamentals played the major role in the author's rank improvement: A quick increment from 14 to 10 kyu relied mostly on the insight that it is possible to learn from one's mistakes. His first read book, Lessons in the Fundamentals, and later the series Dictionary of Basic Joseki each was responsible for another two ranks. At 3 dan, the author stopped for 16 months because he had to understand fundamentals in their details while no book would explain them. Lessons in the Fundamentals mentions some basic topics of fundamentals that one should study but does not go into details. Dictionary of Basic Joseki hides information about fundamentals in the diagrams and in between the lines and the author had extracted every aspect conveyed in these books anyway. So to become 4 and 5 dan, he discovered more and more details of fundamentals by himself. This knowledge continues where those other books stop and is conveyed in Joseki / Volume 1: Fundamentals or will be explained in the later volumes. first to introduce the very useful terms direct versus indirect connection, direct versus indirect capture, connecting and cutting block, empty net, light remainder, proto-group etc. The book contains three types of diagrams: whole board diagrams (mostly games), variation diagrams with move-sequences and diagrams with marks only (denoting currently discussed move types, meanings of stones or development directions). Although the overall distribution of these diagram types is reasonably balanced, 19x19 diagrams occur mostly only in the chapters The Start of the Opening, Empty Corners during the Middle Game, First Move in the Center, Corner Enclosures, Approach Move to a Corner Stone and Pincer. Since the book is already rather long, the author has refrained from including games also in the other chapters, which concentrate on local behaviour. The games were either played by professional players or involve the author. They are carefully selected for illustrating a chapter's topic well. While of course the reader will see also some spectacular games, most demonstrate ordinary strategies and playing styles. Most diagrams carry captions with often useful, quick hints or additional information. There is a fair balance between general text, which also includes many principles and definitions of terms, diagram comments and the diagrams. Chapters tend to start with general text and end with examples and their comments. Due to the principles, definitions and their explanations, the reader is guided towards generalized knowledge, which he is supposed to learn applying in all his games. Rather than having to reinvent all the theory by himself from examples, the reader is already given the readily applicable result of the author's earlier research in Go theory. The claimed range of the readers' playing strengths from 18 kyu to 3 dan is surprisingly (or shall we say: suspiciously) broad. How is that possible? The author wrote the book with a readership from 13 kyu to 3 dan in mind but several double digit kyu test readers have insisted that the book would be suitable for 18 kyus, too. Players between 1 and 3 dan might fall into two categories: either they have already acquired a very solid understanding of fundamentals or they have not. In the latter case, the book can still be very valuable. Other dan players might consider purchase only for specific reasons like not knowing good handling of empty corners in the middle game yet or appreciating the reference to the very detailed classification of types and meanings. Since the book contains much useful new information for the kyu player, who might possibly not want to buy the book? Maybe somebody without enough energy to eat through the huge amount of generalizing contents or somebody not sharing the author's opinion on the great importance of the fundamentals and their details. After two introductory chapters including a discussion of what a joseki is, each standard first move in a corner (from the 3-3 to the 5-5) is characterized in a manner similar to Direction of Play or In the Beginning. This basic information will be useful mostly for beginners. Nevertheless, it has not been omitted because the author wants the series of books on josekis to be a complete coverage of the underlying Go theory. The later chapter Development Directions is also very easy but contains a few hints interesting also for stronger players (like the reasons for moving out). Similarly, the chapter on Symmetries may look trivial but the author recalls winning a game as a 1 kyu because his opponent did not know the concept of playing elsewhere immediately after an approach move. From an understanding that the first two corner stones can be played in either move order, this becomes a strategic consequence. It is surprising just how great the effect of a firm understanding of the fundamentals is! How many players, even dans, do not dare to play the asymmetrical 3-5 or 4-5? In The Start of the Opening they should learn to abandon their fear. Still about half of the high dan amateurs do not have a profound idea how to handle irregular opening moves. Maybe they should read the relevant chapter Empty Corners during the Middle Game? The short chapter First Move in the Center addresses another topic rarely mentioned in the Go literature. Principles and examples discuss when to choose which kind of corner enclosure (open vs. closed corner, open vs. closed side, narrow vs. wide enclosure), the nature of every type of approach move (from the ordinary types to ko threat and ladder breaker) and which kind of pincer to choose (from "near and low" via "far" to "very far and high"). Subchapters about "center block", not playing a pincer, "returning the pincer" and pincers during the middle game complete the topic. With its 78 pages, the chapter Move Types constitutes the book's core. The following chapter Meanings of a Stone is shorter but also part of the conceptual key. Why are types and meanings of stones and moves so important? They allow us to use a language of well selected terms and context knowledge in the form and principles and standard behaviour of every known term to guide our reasoning and planning through the endless variety of the game's tactical depth. Reasoning and planning do not work well without a good language. Therefore the book dispenses with the unstructured heap of Go terms imported from foreign languages, keeps only the essential terms, suggests more meaningful names for some of them (like "thick extension" instead of "nobi") and adds the useful and necessary, previously missing terms (like the collective term "thick cut protection"). As can be seen, the names of terms are chosen to convey their meaning already directly from the name's words. Furthermore there is a consistency of terminology wherever this is possible: "Connection" can be the type of a move, the meaning of a stone, the behaviour of a group's stones and a strategic concept. Hence planning becomes straightforward: When the strategic aim is to create connection, then one should play a move that is of that move type, i.e. is a "connection". We should not confuse ourselves by using many different names because of varying shapes but we should just use the one term "connection". The book encourages the reader to simplify his thinking by using terms that express exactly the relevant information. The author wants more than to teach the reader well - he wants to reform our vocabulary to make it more efficient, better structured, functionally complete, and more useful in practice. On the top level, the book lists these move types 1) Connection, Cut, Capture, Eyespace and Territory, Sacrifice (they have an identical name of a strategic concept), 2) Extension, Checking Extension, Pressing, Light and Thin Shapes, Attachment (they are other well known general types of moves, 3) Thick Extension, Thick Block, Thick Connection, Thick Cut Protection, Thick Turn, Thick Capture (they are types of moves creating thick shape) and 4) Creating Possibilities, Eliminating Possibilities (they are related to possibilities, of which the strategic concept "aji" is a special case). All these are fundamentals of the game and the list of top level terms is short and clear enough for our regular usage. Hence the reader is given an easy access to the details of those fundamentals, which are explained in the subchapters. Fundamentals should not be sold as a mystery of study that turned Kageyama (the author of Lessons in the Fundamentals) from an amateur into a professional but fundamentals should be presented with a clear structure and together with all the details (subtypes and principles applicable to them) written down. Exactly this is done by the book, which uses the same approach in the Meanings of a Stone chapter. There the top level of the structure is even shorter: Construction, Destruction, Combined Construction and Destruction, Creating Possibilities, Eliminating Possibilities. What does all this have to with josekis? They are created by moves and consist of stones quite like formations during the middle game or in the middle of the board. The move types and meanings occurring in josekis occur everywhere else, too! Therefore the study of types and meanings is much more than a key to an understanding of the basics of josekis - it is also a study of the fundamentals of the game per se! Not by chance some professionals say that they consider their study of josekis a very good means for their improvement. The book discusses almost only josekis or other corner patterns in the example diagrams but the reader should take a broader approach and expect to deepen his overall understanding of the game as well. The author presents the book's contents in a manner that gives the reader multiple chances to improve if only he reads with a broadly open mind of discovering many new things even for the seemingly trivial aspects like connection and cut. The book is well worth buying even for its appendix alone: On just a few pages each, the central aspects of evaluation of territory, local move selection, the gap between wall and extension etc. are explained better than could be found elsewhere easily. 35 exercises and a detailed index complete the book. Volume 1 does not discuss what will be in Volumes 2 and 3: classification of sequences, groups and josekis, strategic concepts and strategic decision making, and application of the theory to specific josekis to be analysed in detail. Needless to say, the book is also everything else than a joseki dictionary. Rather it can be used as a tool for a better understanding of the dictionaries and their countless moves in endless amounts of variations. The book or its planned later volumes are also not a broad study of tactically complex josekis with semeais or a requirement for deep reading. In the author's opinion such topics deserve books of their own that need not specialize in josekis. Finally the series of books will not be a survey on recent innovations of yet deeper and deeper tactical analysis of fashionable josekis. Table of Contents here at Sensei's library and at author's site.